Lt Hollerbach and Maj DeFord both participated in this year’s Urban Shield exercise, albeit in two totally different functions: Maj DeFord in the field, working on medical scenarios, and Lt Hollerbach looking at the big picture. The Alameda County Sheriff’s Office hosted Urban Shield 2015, a planned training exercise involving local, national, and international first responder agencies. The event began Friday, September 11, 2015 and ended on the following Monday. 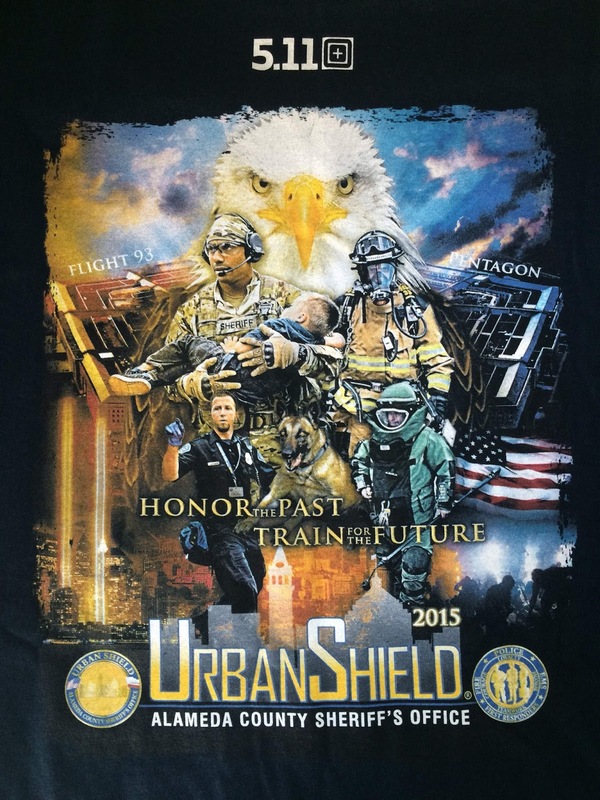 Urban Shield is separated into 10 operational Area Commands designated Black, Blue, Gold, Green, Silver (all tactical), Red (fire), White (EOD), Yellow (mass casualty event), EMS (no color designation), Medical Branch (no color designation). Maj DeFord, who is also an emergency room physician, helped with SWAT team training for mass casualty incidents (MCI), where SWAT teams got EMS teams to work with them, going in after the scene was secured to help triage and evacuate the victims. According to Maj DeFord, the scenarios were “a whole lot of fun!” Anywhere between about eight and several dozen victims were out to be sorted and moved to casualty collection points with a certain need for haste, given how much the victims outnumbered the rescuers. The victims were in full moulage, and even a few mannequins to represent more gruesome injuries (amputations and the like). One of the other scenarios Maj (Dr!) DeFord participated in was the MCI drill: An EMS team had a small fleet of ambulances and a large number of victims that they had to re-triage, load on ambulances, and bring to the scenario, where Maj DeFord and others played the receiving emergency room, handling a flood of victims requiring more definitive care (blood, chest tubes, surgery, and the like). As part of her ongoing PIO training, Lt Hollerbach was fortunate to be invited as observer into the Oakland Emergency Operations Center (EOC), as part of the Yellow Command training. In 2013, the Bay Area Regional Catastrophic Planning Team collaborated to establish a “Yellow Command” component to Urban Shield to complete a full-scale exercise to test the Regional Catastrophic Earthquake Mass Fatality Plan. The goal of Yellow Command 2015 was to engage EOCs throughout the Bay Area Region and promote coordination across agencies and jurisdictions in response to a complex coordinated terrorist attack. It involved live communication from two field play sites to local EOCs, driving regional coordination regarding needed resources and mutual aid. The exercise focused on validating the roles and responsibilities of regional transit agencies per the Regional Catastrophic Earthquake Mass Transportation and Evacuation Plan. Yellow Command also provided an opportunity for Bay Area agencies to practice the use of regional tools such as Cal COP (CA Common Operating Picture) and Web EOC for maintaining situational awareness and communications with regional partners during planned and unplanned events. Cal COP leverages local and regional risk management and critical infrastructure assessments—layered with real-time, intentional, technological, and natural hazard threat information—to create a common threat awareness picture. Web EOC is the crisis information management system used by emergency management officials during an activation of their Emergency Operations Center (EOC). Two-way integration of Cal COP and Web EOC significantly enhances situational awareness across emergency management and public safety agencies. In the exercise that Lt Hollerbach participated in, the EOC was activated a few minutes after 9 AM, continuing until noon. The scenario started with simulated attacks in various parts of the Bay Area, with Oakland monitoring the situation. Throughout the morning, the scenario unfolded, with additional crises and coordinated (simulated!) attacks continuing. Although most of the training was communications oriented, the EOC was staffed with IC, Planning, Logistics, Operations, and other sections, in addition to PIOs. This was great, to see the whole incident management system come together. Since Lt Hollerbach was the least experienced person in the room (at least in the context of handling mass casualty events), pretty much every conversation she had with team members was a learning experience - both in furthering her PIO training and and in seeing firsthand the entire command structure in action, in a large-scale event spread across the entire Bay Area, with multiple jurisdictions coming together and sharing information and resources. No details of the scenario or any photographs of the EOC, for security reasons. All you get is a photo of the t-shirt! If you want to see more, you’ll have to find a way to participate next year. The skills and professionalism of the people staffing the EOC were impressive. 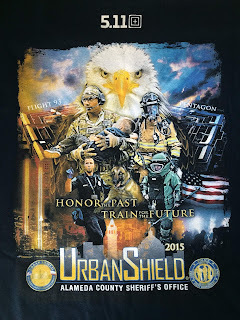 Many thanks to Urban Shield and particularly the EOC for letting us participate.